The fight is between forces backing President Salva Kiir and those backing Vice President Riek Machar, and the DW has a primer on their long rivalry for power, one that got violent soon after the country's independence from Sudan in 2011. Read this and understand why it's SPLA-IG vs. SPLA-IO. Adding to this web: A post at the Conversation suggests that a third man, Paul Malong, might hold the real power in the country. Kenya's ambassador says the latest fighting was set off by a bogus Facebook post by Machar's spokesman saying Machar had been arrested, even though the VP actually was in a security meeting with the president. The Star of Kenya explains. The spokesman, however, says he made the post after violence had started, fearing that a plot to detain or harm Machar was underway. The US has ordered non-essential employees to evacuate, and several other countries were doing the same. The BBC has details. Few details were released on the new US troops, but they're from the US Africa Command's Crisis Response Force, reports the Marine Corps Times. They'll protect employees staying and help those leaving do so safely. In addition to reports of more than 200 people killed, the renewed fighting has displaced about 36,000 people, says the UN. Worse, even before this, "the humanitarian situation in South Sudan was already dire." 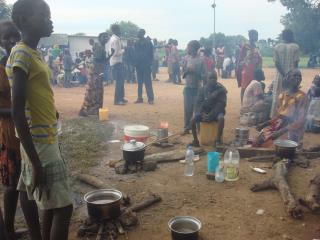 Read the plea for help from a UN humanitarian official here. Aid workers in the nation face huge problems, but a 28-year-old from San Diego hasn't lost hope. See NPR. I haven't seen anything about this, I am going to look into it more, thank you Newser. "The fight is between forces backing President Salva Kiir and those backing Vice President Riek Machar". The parallel for our country would be President Obama leading an army against Vice President Biden's army. This sort of thing can only happen in an African sub Sahara country. "Why US Troops Were Just Sent to the World's Newest Nation" Because we did not want them to feel left out. We send U.S. troops everywhere else.